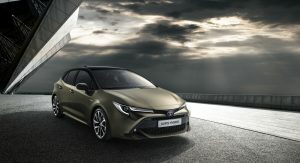 While the new Supra concept might be Toyota’s headline-grabber, the company also revealed the all-new Auris at the Geneva Motor Show as well. 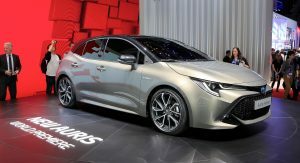 The new Japanese Golf rival impresses with its bold exterior styling, a feature that wasn’t present in any of its predecessors. 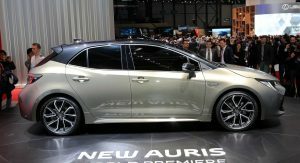 Overall length has been increased by 40mm, all of which has gone into the longer wheelbase while the overall height of the new Auris has been reduced by 25mm. 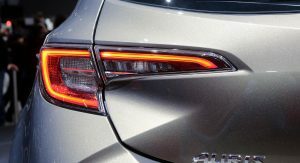 The cowl height has also lower by a significant 47mm, resulting in a shape that’s sleeker and generally more attractive. 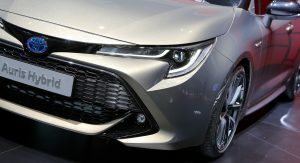 Underneath the new bodywork lies Toyota’s TNGA platform, which also underpins models like the Prius and the C-HR. 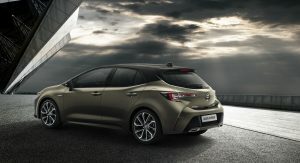 The adoption of the new architecture gives the new Auris a lower center of gravity along with a more rigid body shell and a multi-link rear suspension, with Toyota claiming that the driving experience will now be more rewarding than before. 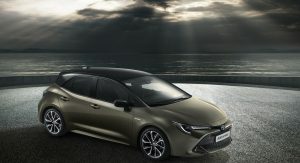 The new Auris is also the first model to be offered with two hybrid options in its range, starting with the 120hp (122PS) 1.8-liter found in the Prius and C-HR and an all-new, more powerful 2.0-liter petrol-electric option with 178hp (180PS). 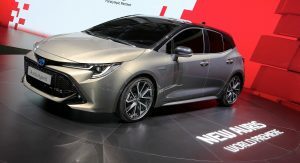 Toyota says that the latter will offer an ‘energized drive’ and will feature steering wheel-mounted paddles for more engagement, while the base model will be powered by a turbocharged 1.2-liter petrol unit with 114hp (116PS). You missed the part where it is build on TNGA – google that one up. Second life cycle when it is a one year old platform, and a much improved one at that? What’s with that thin exhaust? Fake? they will. They don’t believe in Diesels is the future for motoring. but overall its pretty decent. This actually looks very nice. 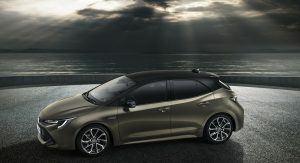 This is the first Toyota offered in Europe for decades which I find attractive and would actually buy. Sad that there will be no diesel option. 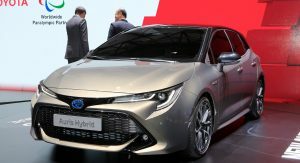 I am not convinced that Hybrids are the best solution for those who drive long distances which involve a lot of highway (Autobahn) routes. For the city it is an advantage, but not for the highway where the extra weight negatively impacts fuel economy. I have to mention that diesel and hybrid vehicles have the same weight. 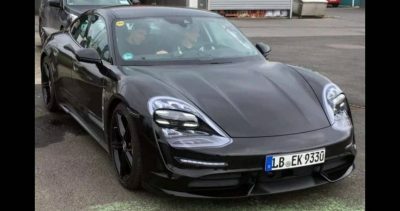 Battery weight is about 40 kilos and the transaxle with two electric motors is there instead of gearbox. 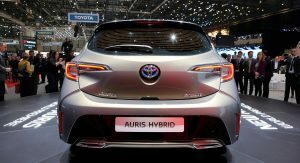 Actually, the new hybrid system from Prius (2017) is probably lighter than average diesel with all the emission stuff thrown in. We are talking about much lower eco taxes, no need to fix all the diesel specific exhaust systems that seem to have problems in newer vehicles due to strong regulations, over 50% better city mileage and about 20% worse highway mileage. 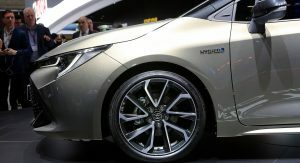 Also note that toyotas hybrids have planetary gearset (not belt CVT) which makes them also automatic and there is not clutch as electric motors is what sets the speed. 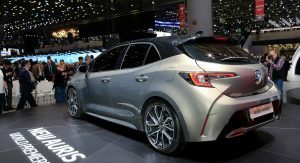 Looks good and with the 178hp hybrid engine, Toyota has a killer on its hands. hands and efficiency at the same time. Looks better then the old one. 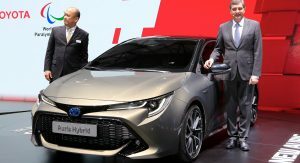 An atractive Toyota for Europe??? What’s next? Pigs flying? Looks good in high level trim. 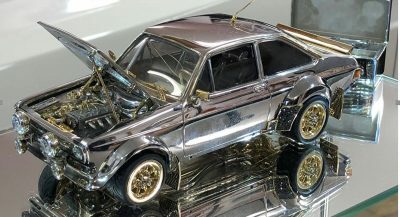 Without the black roof and with smaller wheels, it won’t look as sharp. Still too much of a bigmouth, but I kinda like it otherwise. 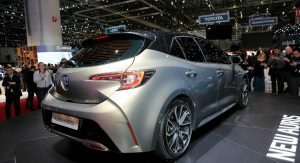 I would say it will only be fazed out in cars and the smaller SUV’s which sell in greater numbers in Europe than the larger 4WD’s and trucks. 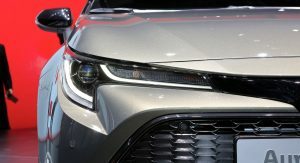 In Australia, the Landcruiser, Prado, Fortuner and Hilux are majority diesel so these are lucrative sales that Toyota would not want to lose. 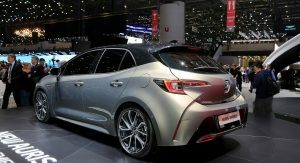 These vehicles don’t sell in huge numbers in Europe like they do in Australia as well as South-East Asian, African and Middle Eastern countries, so I don’t think the move away from diesel would affect these vehicles. Looking sharp, good job Toyota. 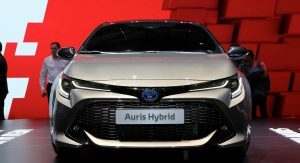 I think it could use 1.6 turbo engine right before hybrid versions, but Toyota likes it simple I guess. FOR GOD SAKE WHY NO INTERIOR SHOTS !!! 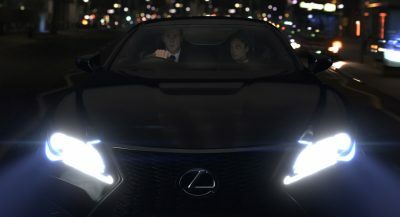 Windows are all black out, which means Toyota still did not decide how the interior will look like. 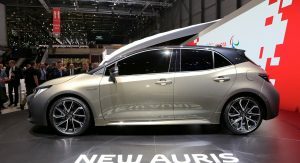 Probably the auto show happened before they had all the details ready, and decided to present the car any way, but without an interior. WITH ALL THE UGLY CARS BEING SHOWN HERE THIS IS ACTUALLY ONE OF THE PRETTIER ONES. Not too bad lookin actually.